Educators at four Chicago charter school campuses went on strike Tuesday morning after months of contract negotiations failed to secure the pay raises and classroom improvements they’ve demanded from their operator. Teachers at three Chicago International Charter School high schools and one elementary school hit the picket line early Tuesday after the latest bargaining session with Civitas, which employs staff at the schools, ended without a deal. 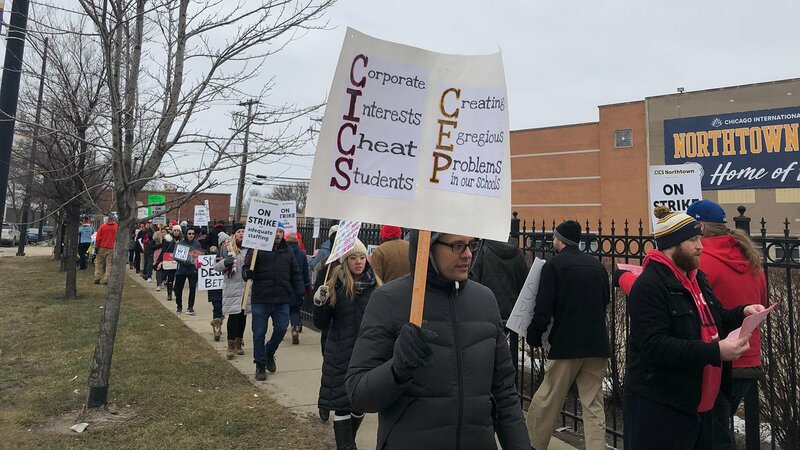 Along with Wrightwood, teachers at CICS Northtown, CICS ChicagoQuest and CICS Ralph Ellison high schools walked off the job Tuesday. Those schools collectively have about 2,200 student. The educators, who are represented by the Chicago Teachers Union, say CICS refuses to use a $36 million surplus on staff raises or classroom improvements like a cap on class sizes and expanded special education services. CTU leaders said the charter operator saw a 13-percent increase in funding from Chicago Public Schools last year, up to $93 million. But they said CICS has upped its management spending by more than 30 percent, while student services spending increased by just 3 percent. Teachers at CICS earn, on average, almost $10,000 less than their counterparts at other CPS-run schools, according to the teachers union. But CICS and Civitas have refused demands they believe would have a “significant negative impact” on students, including a shortened school day and reduced instruction time. Civitas also wants to maintain its ability to remove a teacher if it believes that employee is not fulfilling their job responsibilities. This is the second charter strike in Chicago in recent months, after teachers in 15 Acero charter schools took to the picket line in December. That marked the first charter school strike in U.S. history. The two sides in this strike have held more than 30 negotiating sessions since last May. CICS operates 10 other campuses which are not affected by the strike. The schools that are impacted will remain open during normal hours (8 a.m. to 3:30 p.m.) with principals and other non-union staff expected to maintain operations. Any after-school and extracurricular activities are cancelled during the strike, but the schools will still provide breakfast and lunch to any students who arrive on campus. CICS was founded more than 20 years ago. It has around 8,500 predominantly minority students and nearly 600 teachers across its 14 schools. If a deal is not reached during a Tuesday bargaining session, teachers say the picket lines will return Wednesday at all four schools.